It might be more appropriate to call this “multi-titled,” rather than “untitled.” In my mind, it’s a toss up between “On Thin Ice” and “The Beginning of the Thaw.” Either title could describe both the photo and the general tenor of D.C. at the moment, but I’m not sure which is most appropriate this week. Still, it’s a great photo. If you’ve spent any time in D.C., you’ll recognize the spot. I was standing at the foot of the stairs to the Lincoln Memorial (which is to my back) and looking onto the reflecting pool, with the Washington Monument and the Capitol in the distance. 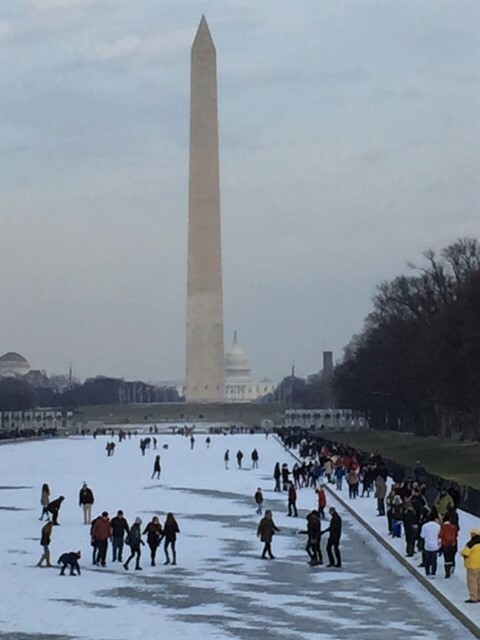 I don’t recommend venturing out onto the reflecting pool, even after a deep freeze. Even worse to do it in large numbers. Immediately after I snapped this photo, one knucklehead fell through the ice. (Not to worry: the pool is shallow. Still, the cold and humiliation must have stung badly.) So there you go, the curse of thin ice. Thin ice seems to be a world-wide problem at the moment, whatever the weather. It must be quite embarrassing to break through the ice in a place like this. Great shot!